About two years ago, Ce Rosenow (whom a P&PC office intern has since dubbed the undisputed Queen of Hai-cool) did two reviews of Ryan Mecum's books Zombie Haiku and Vampire Haiku that went on to become some of the most popular postings in the history of this blog. Thus, when P&PC readers more recently flooded us with mail asking for some sort of commentary on the recent spate of haiku on New York City street signs—and, as you know, P&PC has a particular fondness for the poetry of street signs—we knew exactly where to turn. 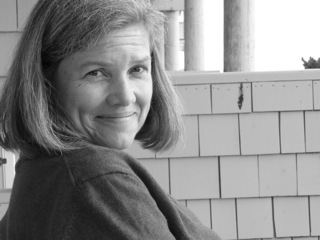 In the following essay, Rosenow, who is currently president of the Haiku Society of America and founder of Mountains and Rivers Press, not only offers her take on the Big Apple's "Curbside Haiku," but also on related phenomena in Atlanta and West Hollywood and on a public culture that seems to have gone hai-cuckoo for the 5-7-5 form more generally. Last fall, New York City installed the public art project "Curbside Haiku" by John Morse. 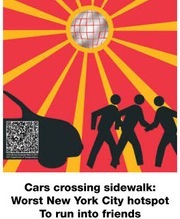 The project features a series of signs (such as the one pictured here) containing artwork and nonliterary haiku which warn readers of various traffic dangers. "Curbside Haiku" is similar in form to Morse's 2010 work "Roadside Haiku" in Atlanta. 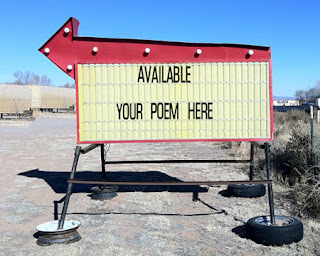 Rather than warning signs, "Roadside Haiku" features "bandit signs" described by Meredith Blake of The New Yorker as "those dubious-looking advertisements that dot the country's commuter roads, promising fast money, easy weight loss, and painless hair removal. 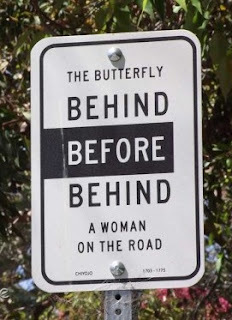 [They are] usually tacked to telephone poles or stoplights ...." Morse's haiku signs also recall the work of Los Angeles-based artist, Rebecca Lowry, whose installation REGARD. appeared on the streets of West Hollywood in 2010. 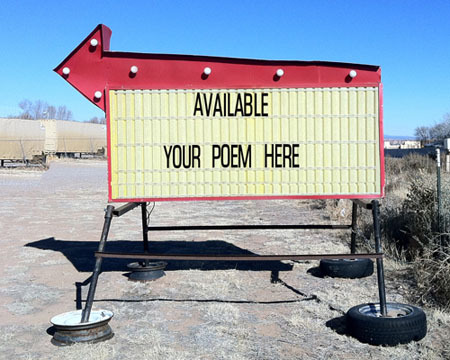 Given the relatively high profile of these projects, I began to wonder about combining haiku with roadside signs and why the artists chose haiku rather than some other form of verse. 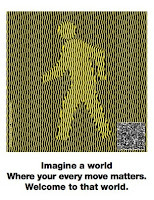 Morse's "Curbside Haiku" contains 216 signs featuring twelve different designs; ten are in English and two are in Spanish. They are located throughout New York's five boroughs at "high crash locations near cultural institutions and middle and high schools." 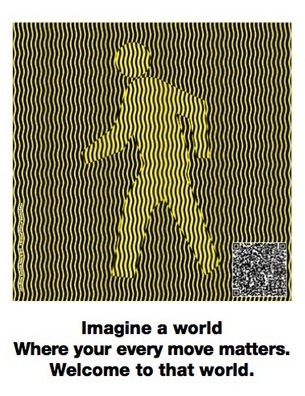 Each sign has a haiku-like verse and a related visual image or an image and a QR code for smart phone access. And you, flesh and bone. 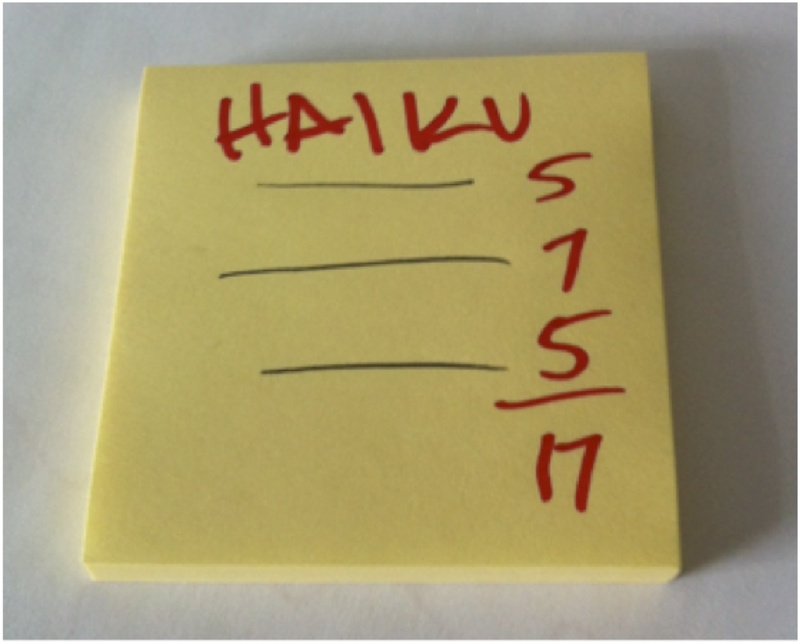 In both cases, the goal is to convey a message that has nothing to do with the typical content of haiku. 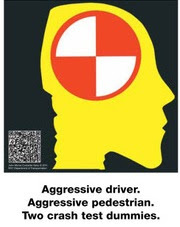 Rather than using "imagistic language to convey the essence of an experience of nature or the season intuitively linked to the human condition," as the Haiku Society of America defines haiku, the poems and images on these signs are designed to raise awareness of traffic dangers and protect the public. Morse states that he strives to "engage, edify and inform," and he creates content with this goal in mind. HANG UP YOUR CELL PHONE. 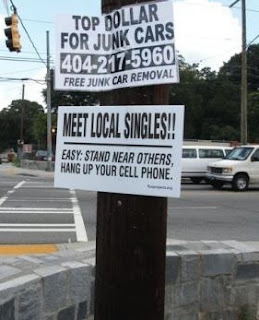 Morse's signs look exactly like the actual bandit signs found next to them on telephone poles or roadside posts (see the picture here), and they are nearly as ubiquitous as their conventional forbears: there are now 500 pseudo haiku bandit signs scattered across Atlanta—fifty each of ten different haiku. Again, some of the poems are in English and some in Spanish. 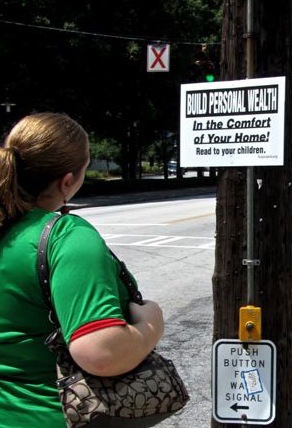 Morse's project suggests that bandit signs are inherently predatory, taking advantage of people's insecurities and greed. As a corrective, his poems use humor and, at times, pointed advice, to change people's thinking not only about the motivation behind bandit signs but about their own participation in the culture that makes the bandit sign enterprise possible. Morse notes, "There’s a great deal of bad in the world, and one of the few things that ameliorates the cruelties of the world is art." He wants people reading his signs to examine their motivations and behaviors, possibly increasing their ability to think critically about the world and their place in it. As I mentioned above, the poems in Morse's installations are not haiku, and therefore confusion about the haiku form proliferates with the publicity surrounding the installations. 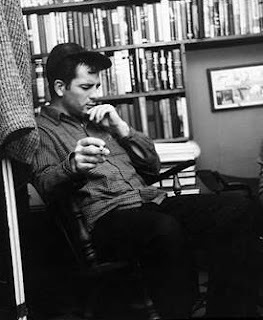 Articles and interviews refer to the poems as haiku, in some cases pluralizing haiku with an "s." True, Jack Kerouac (pictured here) intentionally changed haiku to haikus, but that's not what's happening here. (For a recording of Kerouac reading his haikus, click here.) If the poems aren't haiku and the intent is to either make readers safer or more socially aware, then what value comes from calling them haiku? In thinking through Ryan Mecum's Zombie Haiku for P&PC two years ago, I described the way in which haiku as a form entered American literature. Just as those origins help explain Mecum's use of haiku for narratives about zombies, vampires, and werewolves, they also suggest a reason for incorporating haiku into something as seemingly unrelated as municipal signage. Modernist poets, and in particular those affiliated with Imagism, saw haiku as a means to an end. Rather than study the form in depth in order to create a viable form of English-language haiku, writers such as John Gould Fletcher, Amy Lowell, and Ezra Pound used elements of haiku to construct a new form of poetry. 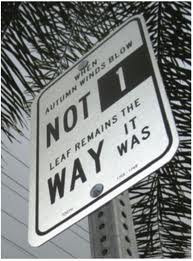 Similarly, Morse uses haiku not to make new American poetry but to make new the ways in which urban signage communicates with the public and to reinvigorate the importance of poetry in the public sphere. 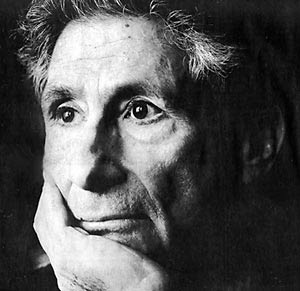 The poets mentioned above also drew on the turn-of-the-century view of Japan that can be understood as one American version of the Orientalist discourse theorized by Edward Said (pictured here) in Orientalism. While Said's work focused largely on the Middle East and Western Europe, it has been adapted and applied to the Far East and the United States. What is relevant to considerations of Morse's pseudo haiku is that, in this discourse, Japan figures as, among other things, an exotic culture that is entirely other than that of America. Modernist poets read texts by late nineteenth-century writers such as Ernest Fenollosa and Percival Lowell that portrayed Japan in this way and, furthermore, emphasized its role as an artistic and cultural resource for America to mine. When the modernists discovered haiku, they found a poetic form that carried Orientalist associations into, and thus helped exoticize, American poetry. Poets drew on elements of haiku to emphasize the difference between their poems and those by popular, non-modernist contemporaries and poets of the previous era. This association of haiku with difference continues today in the alignment of nonliterary haiku with edgy or unusual topics and forms of transmission. 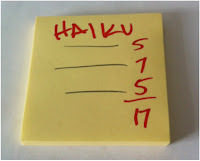 Simply put, regardless of the quality of an individual haiku-like poem, the form itself brings attention to the subject matter because of the ongoing association of haiku with foreignness. This sense of difference also helps create distance between haiku and the public perception of poetry as high art; limiting the defining char- acteristic of haiku to a mere syllable count and ignoring haiku's traditional subject matter only increases this distance. Such distance is necessary for the success of projects that have a largely nonliterary agenda because it makes the poems seem more accessible; anyone can write them, and one can write them about anything. The public response suggests that this approach works. The publicity generated by "Curbside Haiku," for example, resulted in a wave of new "haiku poets" and a barrage of "haiku." Morse notes that "One of the joys of doing this sort of thing is how many people have responded to it with their own haiku ... There's just a plethora of haiku coming out. It’s so exciting." The public response illustrates the complexity of using pseudo haiku, even for worthwhile civic and artistic projects. Morse's work is creative, engaging, often humorous, and well-intentioned. After Morse, New York City may see a reduced number of traffic accidents, and Atlanta residents may view bandit signs with a warier and wiser eye. Art and poetry have been used, as Morse states, to "do a great deal of good." But is there a risk in this endeavor? Do these projects participate in maintaining the remaining strands of the Orientalist discourse in which haiku first entered the American consciousness? Possibly. Morse's poems still seem to suggest that Japanese culture remains something exotic and other, that this centuries-old Japanese poetic form is somehow less literary than other poetic forms, and that Americans can continue to use haiku (and, by extension, Japanese culture) as resource to meet American needs, civic or otherwise. If an appeal to popular culture were not central to the use of pseudo haiku, then these projects could be modernist indeed. Rebecca Lowry's project REGARD. also utilizes urban signage, multiple languages, and Japanese poetic forms. As such, it shares some common characteristics with Morse's work but, as a few examples will show, it also differentiates itself from Morse's work in marked ways. 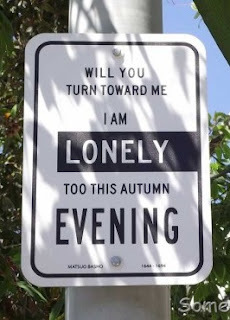 For the West Hollywood installation, Lowry created eleven municipal signs that resemble parking signs, each featuring a haiku; some signs are in English, some in Spanish, and some in Russian. 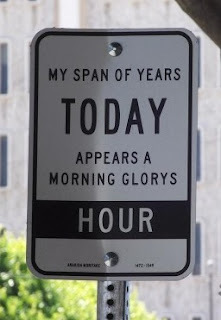 Lowry chose haiku that included words typically found on parking signs. She explains: "On parking signs, there is usually text in a larger and or contrasting font that can be read easily from a distance, giving you the main gist of the message 'NO PARKING' or '2 HOUR' and then as you get closer, the fine print fills you in on the details. So I looked for poems that had a similar capacity: poems that, with certain words highlighted, are read one way, and that then could be comprehended in their entirety closer up." Like Morse, Lowry draws viewers in with the familiar and then, as they keep reading, presents them with the unexpected. 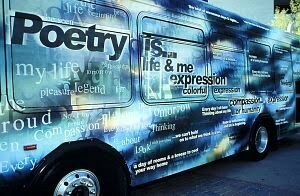 She says, "I see these poem signs as a shared thought across time, a shared moment or experience. I hope to stop people in the course of their days and give them something to ponder, to take with them as they carry on." Her project, however, diverges from Morse's in what she asks people to think about and the poems she uses as part of her means of asking. These haiku are literary because they combine both the form and content of traditional haiku; they may suggest a relationship between nature and the human condition or between two simultaneously occurring images in nature. Notably, the poems don't provide anything beyond their expression of the haiku moment. They offer the surprise and insight characteristic of haiku without pronouncement or instruction. Readers are left to consider on their own the wisdom afforded by such expressions. Lowry's artistically rendered literary haiku disrupt the lingering vestiges of nineteenth- and twentieth-century American Orientalist discourse because, unlike Morse's poems, they don't trade on the sense of foreignness. Her signs offer haiku as haiku, not as a vehicle for a separate message that requires the suggestion of difference to gain attention. As the above three art installations suggest, a poetic form as concise and dense as haiku is congenial to adaptation. In addition to urban signage, both literary and nonliterary haiku have appeared in a variety of venues, including theater marquees and buses. 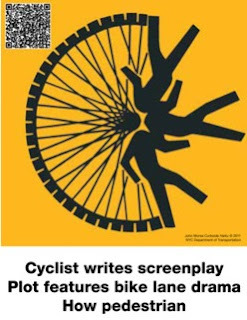 As long as pseudo haiku circulate so widely in popular culture, however, it's unlikely that literary haiku will be incorporated as frequently in civic and artistic projects. 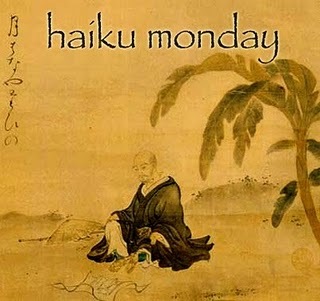 The popular understanding of haiku will continue to be based on the most visible examples of the form: the abundance of pseudo haiku will simply create more pseudo haiku. Possibly, if literary and academic communities become more informed about the American haiku movement and continue, as we’ve seen recently, to analyze, write, and publish texts of or about literary haiku, the conventional understanding of haiku may move away from that of the early twentieth century and toward a more developed understanding in the twenty-first. Thanks to Angie Thompson for her suggestions during the writing of this essay.